It’s been a week now since I finished the fling, my legs started to feel human again about Monday evening and I even went for a 5km slow run on Wednesday morning without any real discomfort. All in all, I feel like I got away with it in the recovery stakes. I didn’t know what to expect after running such a crazy distance, 53 miles is a bloody long way, and how I felt immediately afterwards suggested I was going to be walking like someone who’d shat themselves for weeks to come. I didn’t though and in the post race high, I’ve spent a lot of time thinking about what I would\will do in the next ultra. Several times I’ve stopped myself and asked “Whoa there! Your next one? Who said this was something you’d be doing again?”. As the days go on though, all I can think about is giving this whole thing another try. I think one of the things driving this though is all the niggly little things in the fling which I feel didn’t go as well as I hoped they would. Running an ultra takes a lot of training and a lot of planning. 1. Time – real food takes time to eat, in a race, you need to save time, even a long endurance race like an ultra. 2. Bulk – my drop bags were huge, which I know isn’t a problem. When I transferred the food to cary with me to the next CP though, that turned me into a pack mule. I don’t want to be that runner. 3. Gagging – real food, after 20 or more miles, is a real turn off. Knowing that I had to eat my sushi roll or sandwich to give me the calories to get me through to the next CP really ate away at my mind in the race. All I wanted was liquids. In the drop bag at each checkpoint I had things to eat at the check point which were a veggie sushi roll to give me lots of rice for the carbs and seaweed for some nutrients. I also made a sandwich for each checkpoint. I’d tried both in training runs, but after 20 miles, neither worked. In each bag I also had snacks to take with me on the next stage. I had a chia charge flapjack, which are fantastic bundles of energy. I’d also made up some ziplock bags too with some cashew and almonds as well as dried apricots and figs. I also had some high 5 Zero tabs in each drop bag to put in my water bottles to keep my electrolyte levels up. Lastly, I’d cut an orange into segments, one for each bag. In my training runs leading to the fling, I found that after a while, my mouth just wanted something refreshing and I thought that oranges would do the trick. The sandwiches, whilst sounding like a good idea, really sat heavy and were really hard to eat. That meant that I spent so much more time in the checkpoints than I wanted to, but also it just added to the gagging feeling I found I got after about 20 miles of running. No more sandwiches then. The sushi was also like eating soggy cardboard by the time I was on my 3rd round of it, and I never want to see a sushi roll again as a consequence. The snacks worked out ok, on much of the walking uphill sections I tucked into the fruit and nuts pouches. I don’t know how much they gave me in terms of energy or nutrients, but they were tasty and easy enough to eat, so I think they can stay. The oranges were divine and really lifted me. They are a must for next time. From the 2nd checkpoint in the race, all I wanted was liquid. In hindsight I wish now that I had used some gels in the 2nd half of the race. I really don’t like them, but I see now how liquid calories are probably the right thing to do in a 50 mile+ race. I’ve done some research over the past week and discovered Tailwind Nutrition. I manage to grab some of their endurance powder whilst in Seattle for work this week to try it out between now and Edinburgh marathon at the end of May. I’m hoping that something like this will be at the core of my strategy next ultra. That would mean I get refreshing liquids constantly, my drop bags don’t look like a picnic hamper and importantly, I will spend less time in checkpoints and have less to carry between them. Icebreaker merino 200 long sleeve – The weather forecast was cool\cold and the merino top works for me in most temperatures. OMM Kamelika Smock – The weather forecast showed rain and possibly snow. This smock has seen me through the worst of the Scottish winter hill running. Generally, all of this worked well. In future though, I’m wondering if I need to take as much kit. I think I could get away with fewer layers, perhaps just wear one layer and have the smock to go over the top if the weather turns horrible. I was looking at what other people use, the guys up the front of the race all seem to run with barely nothing, a hand held bottle, a small bum bag or flip-belt. I’m going to give this approach a try on my next long run and see how it goes. I think it might take some training to get used to it, but if I can, I suspect it will stop me from faffing about in the race with kit on the hoof or in CP’s. I travelled to Glasgow on the Friday before the fling and stayed in a city center hotel. All the hotels near the start line were fully booked by the time I got my arse in gear to sort it out, but they are generally travel lodge type hotels, which I don’t usually enjoy. I stayed at the Hilton Grosvenor by the Botanics. This was a 20 min walk to the race hotel for registration on Friday afternoon which gave me time to calm my nerves down a bit. It was also an easy taxi ride to Milngavie on Saturday morning for the start. I’d definitely do it this way again. With this being my first ultra, I was nervous and really wanted to just stick to a slow pace and complete it. My goal when I signed up to the fling really was to just complete it. It was only as I got closer did I have naïve aspirations of completing it in 10 to 11 hours. My naivety gave me the kick up the arse I deserved in the time stakes, but in general I’m really happy with what I achieved. If I want to improve, I need to change some of the things around my food and kit that I’ve spoken about in this post, but I think I also need to get more endurance training in. I had a long stretch from about 10 to 30 miles where my hips ached quite badly. They were never going to stop me, but I was frustrated that it felt like something that, if I’d trained more, I could have avoided this. What I would like for next time is to hold a steady, slow pace all the way through. Looking at peoples races on Strava, I can see that those that do really well maintain an almost exact pace all the way. My pace varied from 5min\km to 11min\km. I think 6min\km is probably my target pace, but it is going to take some focussed endurance training to get to it. 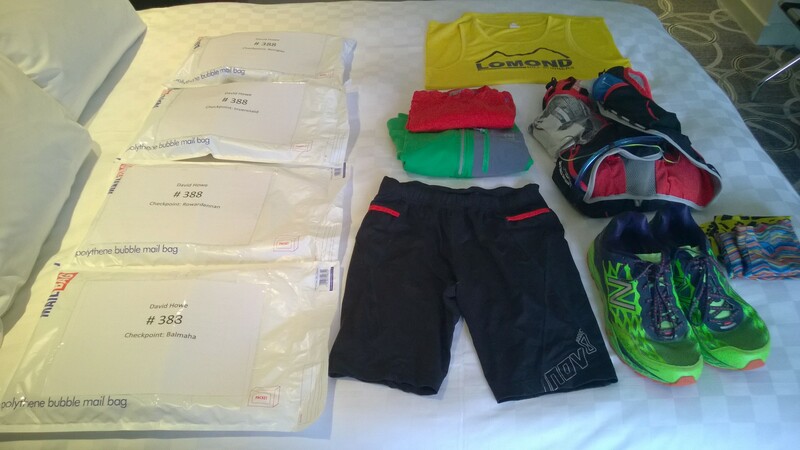 Taking everything into consideration, for my first ultra, I think the logistics and planning worked really well. I never went through a stage in the race where I felt like I needed more food, and I was never in a position where I was worried about getting to the race, having the right kit or anything like that. I think there is room for improvement though. Travel lighter, fuss less at CP’s and focus on getting calories inside whilst on the move. Congrats on your first Ultra. Always good to hear someone’s perspective on a first race.